Notes: Happy Poetry Friday! Thanks to Bridget Magee at Wee Words for Wee Ones for hosting! You can also see a post of mine from a few days ago about my poem being included in the Best of Today’s Little Ditty Anthology: 2014-2015 (Volume 1). You can also enter a giveaway of Finding Wonders. The idea of warmth within winter. A prefect first line. I love this poem. Makes me realize that a season is more than just “a season”. Very nice, Brenda! Bittersweet and evocative! Thanks, BJ. I appreciate you stopping by. Once again, you have dazzled me Brenda. Your words glisten like tiny snowflakes softly falling. I think Old Man Winter is walking the wood, too. Stop by the ridge if you get a chance. I have a poem welcoming the old man as well! 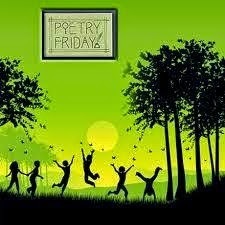 I just sat down with the intention of reading more poetry friday posts, and yours is certainly on my list. Thanks for your sparkling comment. I’ll look forward to seeing Old Man Winter at your site, too. We always think of winter as lifeless, but there is so much inside, if we look under the layers, isn’t there? Nice poem, Brenda. Yes, I think winter is like sleep. Things get to go dormant, heal and recover. 🙂 Thanks for dropping by. I think you’re right about the snow heading our way. There’s a different kind of chill in the air now. Yes, I think Old Man Winter is up and walking. etched by seasons past”. Just right! Even “pale” can be a bright promise for the future. Yes, the paling comes after lots of living and light. And the seasons turn and renew us. Lovely poem and picture, suits this season well!! I love the fall, too. The color, the changing the quality of the light. We all have such potential under our skins, such capacity for joy and hope. Your poem fits perfectly with the day here.. I am not a huge fan of this wet and cold season but it inspires good poetry. I love the fall, the swirl of leaves, the cold snap in the morning air. The smell of snow in early December. So beautiful, Brenda. And a meaningful analogy in the second stanza. They have a beautiful brown under it all, don’t they? Those aren’t around here in Ca. Yes, your flora is very different than here. Beautiful, but different. Thanks, Morgan. You’re a star!